Thanks to goals of Gilardino (65th minute) and Fetfatzidis (84th minute) Genoa beat Lazio and now has 39 points in the standings. Eight matches before the end of the season the remaining in Serie A is already 99% sure. A great succes after the bad start of the season, thanks to the players but first of all we have to thank Mr. Gian Piero Gasperini our friendly coach. In the last 8 matches we have to try to end the season inbetween the first 10 teams in the standing and to be in front of Sampdoria. Reaching the Europa League is almost impossible and the distance between Genoa and the relegation-zone is now 15 points. Let’s hope our players stay competitive till the end of the season. Unless the semi turn-over of Mr. Gasperini (he kept Gilardino, Sculli and Bertolacci outside the line-up) the Rossoblu again played a good match. After 21 minutes Cofie scored the opening-goal after a great action of Konaté. The happiness lasted only 10 minutes when Schelotto scored the equalizer: 1-1. In the 2nd half Emanuele Calaiò was close to score 1-2, but his header was just a few centimeters at the wrong side of the post. In the last minutes of the match Parma tried to score the winning goal, but 2 good saves of Mattia Perin let us return to Genova with a deserved draw. The only negative aspects of this match: the heavy injury of Matuzalem who will not be able to play for the next 5 weeks and the yellow card of De Maio which costs him 1 match squalification but surely he will be substituted next Wednesday against Lazio by Daniele Portanova. 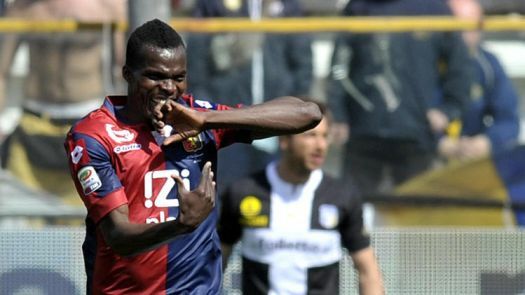 Maybe this was the best match of Genoa so far this season. If Calaiò would have scored the penalty we probably had beaten the Gobbi. Genoa played very agressive with Antonelli, Bertolacci, Burdisso, Matuzalem and Sculli back in the line-up in a 3-5-2 system with a very strong midfield. In the first half 2 goals of Juventus were annulated because of off-side, the first one regulary but the 2nd not. 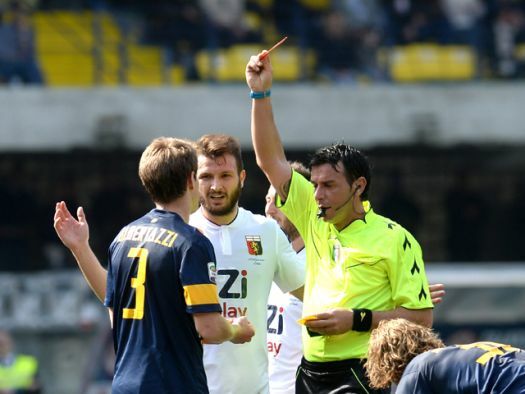 On the other hand Genoa deserved a penalty when Lichtsteiner blocked Bertolacci, but referee Mazzoleni did not react, halftime 0-0. In the 2nd half Genoa was the best team in the field. Mattia Perin was unemployed for a very long period and in the 72nd minute Genoa got a penalty after a handball of Vidal who was lucky that Mazzoleni did not give him his second yellow card. Unfortunately our penaltyscorer Gilardino was substituted 8 minutes before, so his substitute Emanuele Calaiò took the penalty. The shot was too soft and not far in the corner of the goal, so it could be easily stopped by Buffon. In the 89th minute Mazzoleni whistled irregularly for a free-kick against Sturaro just outside the penaltyarea of Genoa. Specialist Andrea Pirlo shot the free-kick high in the 7 of the goal without giving Perin any chance. Genoa-Juve 0-1, sometimes football is so unfair! Tonight we play the big match of the 28th round against Juventus. Against Chievo Mr. Gasperini let Antonelli, Sculli, Matuzalem and Portanova outside the team while Burdisso and Bertolacci were banned because of their yellow cards against Catania. Tonight all 6 players will probably start against Juventus, the team that 99% sure will be champions of Serie A for the third time in a row within a few weeks. 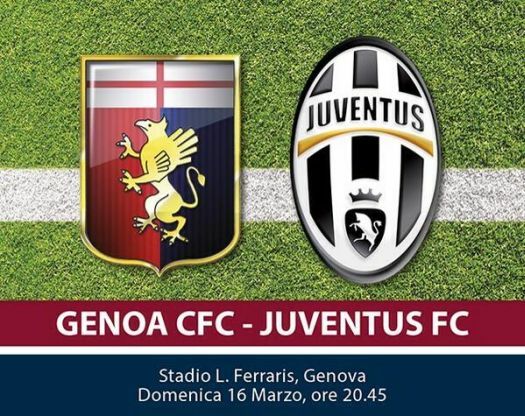 But tonight ….. Forza Genoa! Two stupid fouls of Konaté and Motta (in injurytime) in the penaltyarea against opponents who did not had any chance to score blocked Genoa. Already in the fifth minute Moussa Konaté pulled the shirt of our ex Adrian Stoian who immediately felt down in the penaltyarea. Our ex-striker Paloschi realized the penalty: 1-0. From that moment Genoa was the best team in the field. A great goal of Gilardino in the first half was regulary disapproved because of offside, but in the 89th minute our topscorer finally scored the equalizer: 1-1. A deserved point and game over we all thought, but not Marco Motta who blocked with his arms another ex-Genoano Lazarevic in the penaltyarea in the 92nd minute. The penalty again was scored by Alberto Paloschi: 2-1. A stupid defeat, which should not be possible after the same headless penalty against Burdisso in the match against Udinese. Next week we play at home against Juventus.